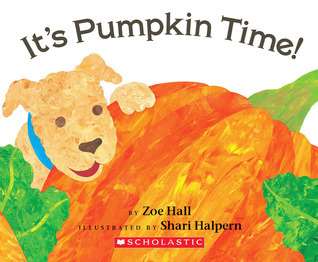 Way back in August, I had an urge to plan a pumpkin-themed storytime. Yes, you read that right: August! I’ve learned that when I have an urge to plan a particular theme, it’s always good to just go with it, no matter how long you have to wait before you can actually present that theme. 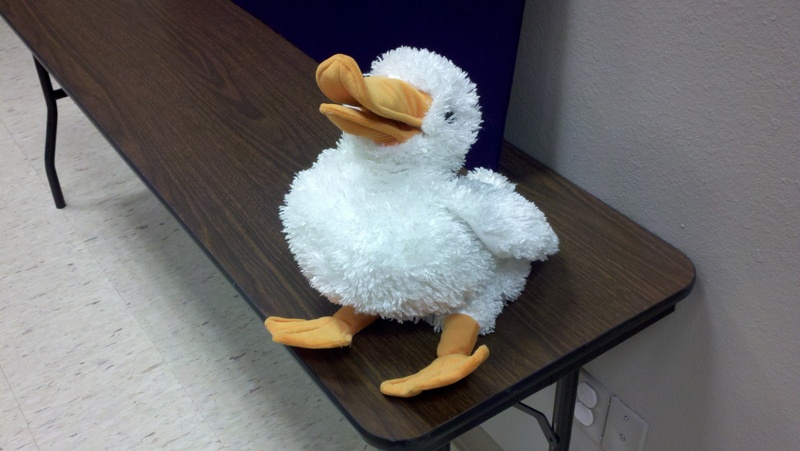 So I planned this storytime in August, and last week I was finally able to use it in storytime! Writing Activity: Pumpkins are a type of fruit, let’s name some other fruit! I’ve changed how I do the writing activity. I used to ask a question and write down whatever the children told me. 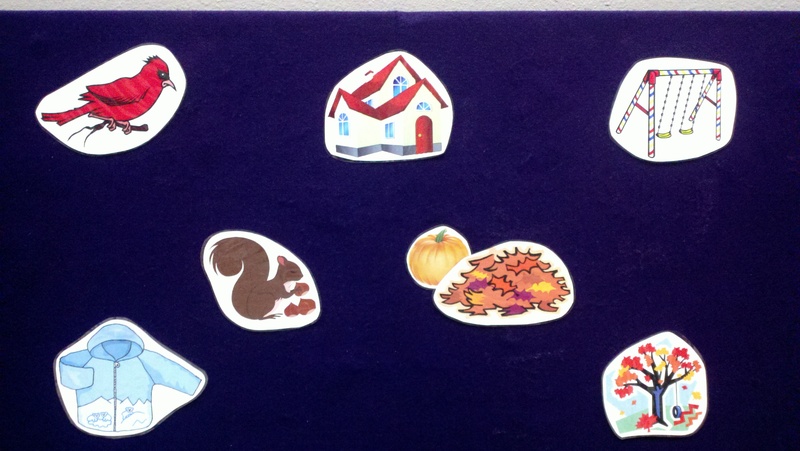 Now I print out and cut out different clip art and tape them to the whiteboard, then ask the children to name what they see on the board. I then write their answers under the appropriate clip art. The kids love this, and I like how it reinforces with written word with the concept (also, I’ll never have to worry about a kid saying something that I can’t spell). 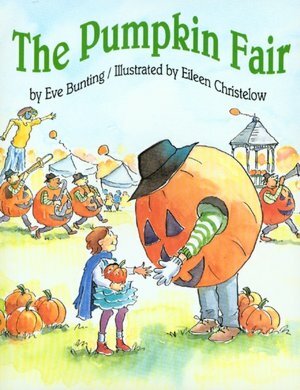 In this story, a girl grows a small, lumpy pumpkin and takes it to the local pumpkin fair. It’s clear that the girl cares for this pumpkin, despite its flaws. She carries it around as she partakes in different pumpkin activities (pumpkin bowling, pumpkin basketball, etc). She doesn’t expect her pumpkin to win anything at the judging contest; however, it wins in the most loved category. This book has a great rhyme and flow to it, which made it easy to read out loud. Activity #1: Where is my Pumpkin? Oh where, oh where has my pumpkin gone? I’m searching and singing my pumpkin song. Oh won’t you please help me. Is it behind the swing set / under my jacket / behind the car / under the leaf pile / behind the tree / behind the house? 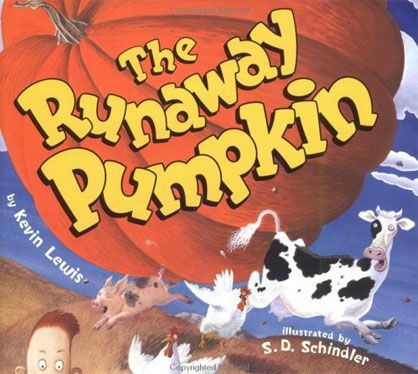 Another story told in rhyme, this book involves a trio of children who find a gigantic pumpkin and cut it loose from its vine, only to have it roll away and reek havoc on their family farm! Things are resolved, however, when their father uses the tractor to make a bed for the pumpkin, which causes it to come to a stop. 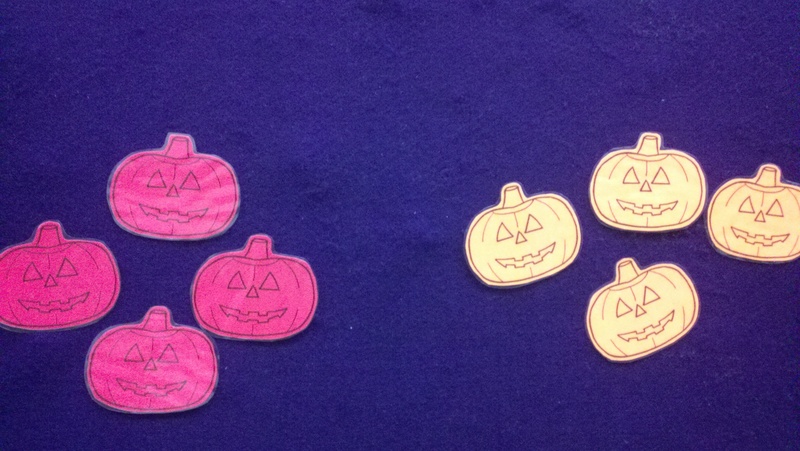 I made different colored, laminated pumpkins and handed them out to the children. I then instructed them to find their matching pumpkin on the board. I’ve found that kids love placing things on the flannelboard, even when it’s a very simple matching game. Rhyme Cube: I’ve been rolling the rhyme cube twice per storytime these days. The kids really love seeing which rhyme comes up. I can’t remember which rhymes we did last week, but I’m sure Row, Row, Row Your Boat was one of them because that one seems to come up every week. This is a simple story about children who grow their own pumpkins and make Jack-o-lanterns for Halloween. It’s short enough to appeal to my younger crowd, but offers some opportunities to ask questions and start conversations with slightly older kids too. How It Went: It went great! Definitely one of my favorite fall themes. While none of the books were big hits with the kids, each one held the interest of the group. And while finding games and matching games are pretty common in my storytimes, the kids never seem to grow tired of them. I will definitely be doing this one again next year.